Hey ImpactECS users! Expand your modeling and analytics capabilities with the latest product updates planned for ImpactECS version 7.5 (and 7.6). Why two releases instead of just one? Well, that’s simple. As the list of features grew, we wanted you to have the chance to get your hands on some of the new functionality quicker, and give you time to plan for some of the bigger product changes. 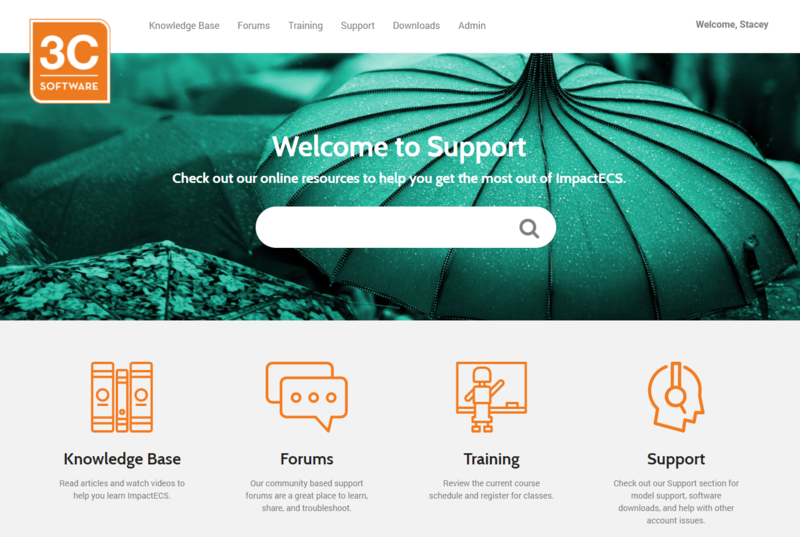 Scroll down to check out some of the new ImpactECS product features and information about a few tools and services offered to support our users. 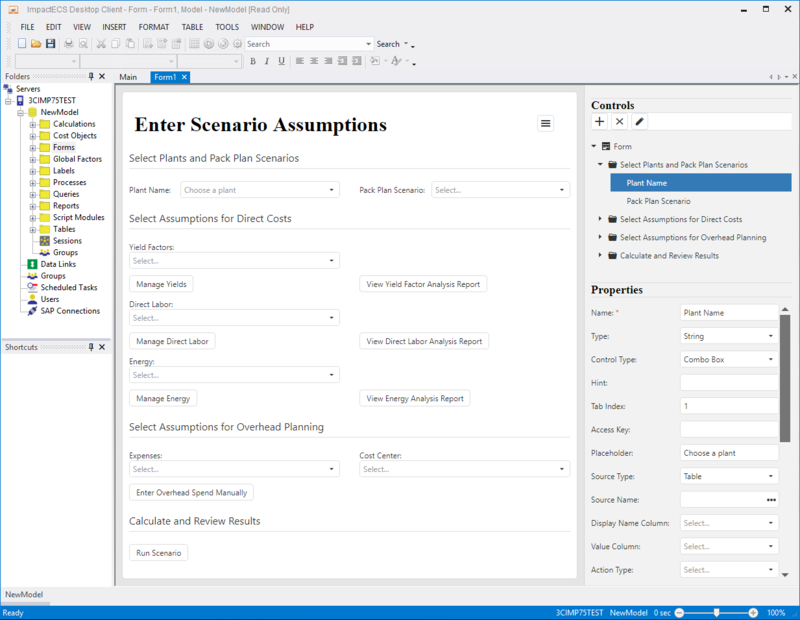 The features included ImpactECS version 7.5 focus on improving the user experience through the new available Forms types, enhanced grid functionality and improved Excel exporting tools. Build custom ImpactECS interfaces faster and easier with the simplified Forms designer. The new Adaptive Forms designer makes it easy to create forms, offers more controls (grids, sliders, switches, and more…), and supports mobile with its responsive layouts. Drag and drop controls onto the form builder, assign actions, and link data sources, to quickly create forms to handle lots of model tasks. Embed adaptive forms in items to improve layouts for Local Factors and Query parameters. Create custom user interfaces (UIs) to deploy over the web with the embedded UI Builder. Now model builders can create and launch unique applications that focus the end user on specific tasks and workflows, making model management and maintenance more efficient. The ImpactECS grid offers lots of functionality to expand the way you interact with the model. New grid features in 7.5 include embedded images for Cost Object buckets and Local Factors, formatting options (show/hide headers, grid lines, and row spacing), and Excel-like filtering features. Context menus are also supported on data rows, enhancing the model user experience. The Export to Excel functionality is completely redesigned to capture a wider range of ImpactECS’s existing formats when exporting items to Excel spreadsheets. Features such as grid outline settings (indented BOMs), row groups, row summaries, pivot tables and charts are now persisted when users export items to Excel. Additionally, this WYSIWYG (What You See Is What You Get) behavior is now supported in ImpactECS Queries. 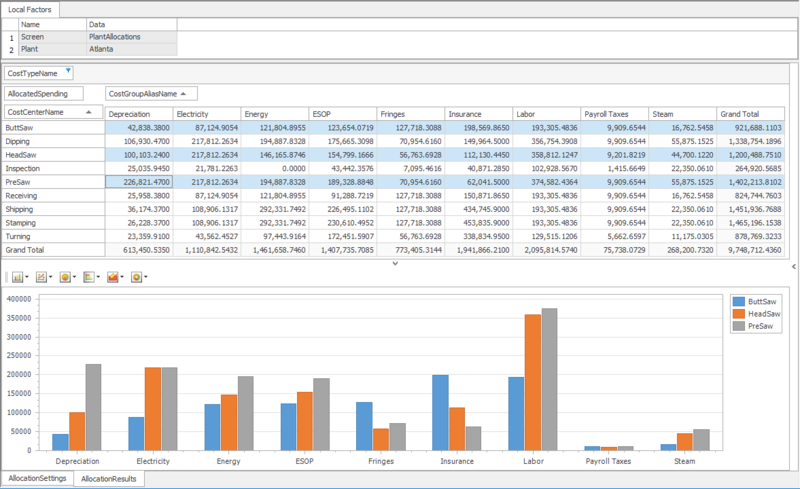 All combined, these new capabilities allow model builders to generate and export basic reports to Excel using existing items. ImpactECS version 7.6 significantly changes the application architecture by switching to a web services communications protocol that opens new options for ImpactECS deployments and integrations. With the demands of enterprise technology changing, ImpactECS version 7.6 marks a significant shift in the application architecture. The ImpactECS communication protocol has moved from DCOM to Web Services, expanding the methods to consume, interact, and access information in ImpactECS. This revamped architecture makes it possible to interact seamlessly with cloud-based apps like Salesforce.com and Tableau. And from a deployment perspective, the new protocol improves ImpactECS deployment over wide-area networks, private clouds or public clouds. With web services, Client-to-Server communication happens through the intermediary Microsoft IIS web server. This process allows ImpactECS to leverage the built-in fault tolerance and load balancing features of Microsoft IIS. In addition, the application layer of ImpactECS server, which executes tasks such as recalculation and script execution, can also be distributed across a pool of machines. 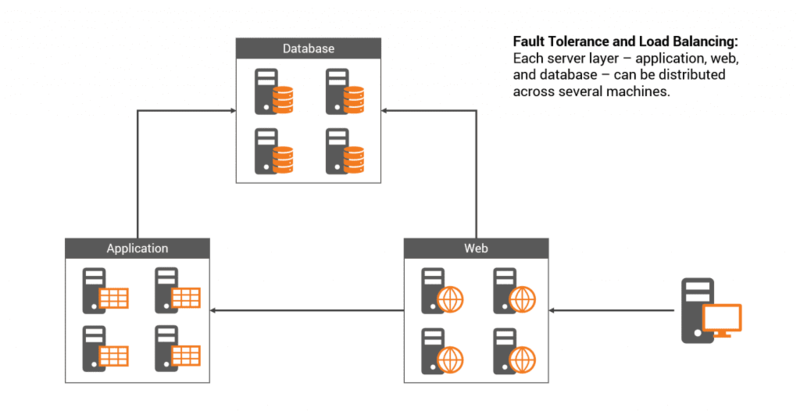 If a server machine fails, tasks in ImpactECS are executed automatically on a different machine, ensuring high availability and fault tolerance. We’re also hard at work developing other tools to help our users get the most from ImpactECS. Check out the details about our new online support portal, our expanded integration toolset including how we’re able to connect sales data through CRMs like Salesforce.com. Access forums, download software, and find answers in the knowledge database of the new online support portal. This community-focused portal is designed to help ImpactECS users get and share information that can help solve problems and advance model capabilities. To gain access to the ImpactECS Customer Portal, contact your company ImpactECS administrator. Take advantage of ImpactECS’ integrated ETL framework to build inbound and outbound data transfers to create a fully-integrated modeling environment. The tool uses standard COM-based objects from Microsoft ADODB and OLEDB frameworks and uses script modules to query external databases via OLEDB or ODBC interfaces. Connect ImpactECS with Salesforce.com or other CRM solutions to build dynamic and flexible quoting and estimating models that gives sales, engineering, and new product development teams the cost and profitability answers they need. Read more about our Configure-Price-Quote solution. Deep dive into ImpactECS features and techniques withe our In-Depth articles. Read the System Requirements for ImpactECS version 7.5. Expand your ImpactECS knowledge with training from 3C Software.